A new block of Master Classes started last Friday. The children chose from a wide selection of skills based classes such as fitness, dance, cooking, yoga, relaxation, traditional card games, Chinese crafts, painting, chess and Lego construction. Masterclasses will continue 3 Fridays out of 4. This entry was posted in Masterclasses, News on Jan 23, 2019 by Dalry Primary Edinburgh. We enjoyed getting started with this year’s Master Class programme. The classes on offer this term are Yoga, running, Chinese craft, Lego movie making, cards, orienteering, geometric art, chess and hamabeads. This entry was posted in Masterclasses, News, Uncategorized on Sep 28, 2018 by Dalry Primary Edinburgh. 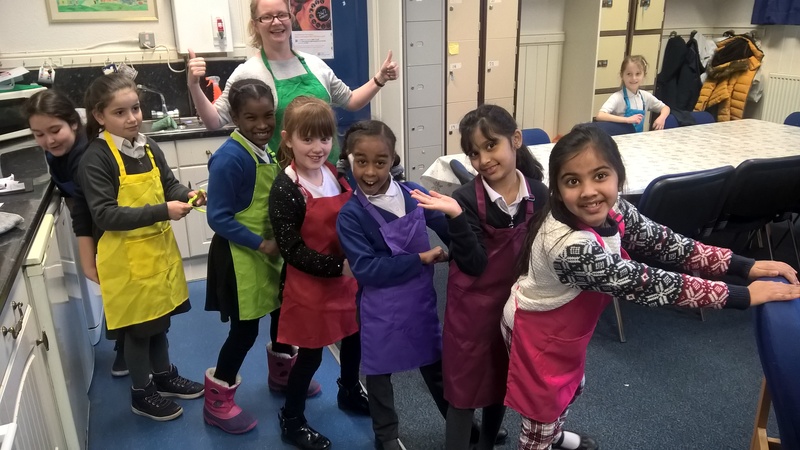 Our cookery masterclass were very excited to be first to use the new school oven last week after the old old one broke down and was replaced after many years hard service. The children are also wearing new aprons purchased by the school Parent Council. This entry was posted in Masterclasses on Feb 2, 2018 by Dalry Primary Edinburgh. The school choir will be singing at the Dalry Gorgie Christmas Lights on Sunday 3rd December, at the Tree outside the entrance to Gorgie farm. It takes place from 6.00-6.30pm if you’re free and would like to come along. This entry was posted in Community Links, Masterclasses, Music on Nov 28, 2017 by Dalry Primary Edinburgh. Our programme of masterclasses, including chess, LEGO, drama games, podcasting, Spanish, baking, animation and many more, has been up and running this year with the pupils having had a chance to try two 3 week courses so far in 2017/18. Some of these courses are taught by our teaching and support staff while others are run by local experts and volunteers including parents. We are always looking to add new masterclasses so if you are available on Fridays between 11.15 and 12.30 and have a skill to share do get in touch. This entry was posted in Masterclasses, News on Nov 10, 2017 by Dalry Primary Edinburgh.